Indian Prime Minister Narendra Modi began a two-day visit to Nepal on Friday as the two South Asian nations work to improve relations that were strained over Indian-backed ethnic protests in Nepal in 2015. Modi first flew to Janakpur in southern Nepal, where he prayed at a revered Hindu temple and addressed a public rally, before heading to the capital, Kathmandu, for official meetings. Nepal’s Prime Minister Khadga Prasad Oli flew to Janakpur to welcome Modi. Janakpur was the center of ethnic protests in 2015 against a new constitution that carved Nepal into seven federal states. Ethnic Madhesi groups demanded more territory in the state assigned to them and shut down highways and border points for weeks. India supported the Madhesi and imposed an export blockade, leading to severe shortages of fuel, medicine and other supplies. Landlocked Nepal gets all of its oil products and many other supplies from India. At the time Nepal was struggling to recover from a devastating earthquake that killed 9,000 people. The protests eventually fizzled out and elections have been held in Nepal since then. Since the December elections, India has been working to improve relations with the new government. 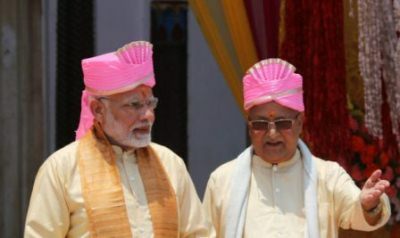 Modi sent India’s external affairs ministers to meet Oli even before he took power, and Oli too flew to India for an official visit a few weeks after becoming prime minister. The two leaders are scheduled to remotely inaugurate a $1.04 billion hydroelectric power plant that is being built by an Indian company in energy-starved Nepal. Nepal’s two giant neighbors, India and China, have competed for influence over Nepal. While India has always had major political and economic influence on Nepal, China has been a big contributor of financial aid, building highways, hospitals and airports. Modi plans to visit two more important Hindu temples before flying home on Saturday.